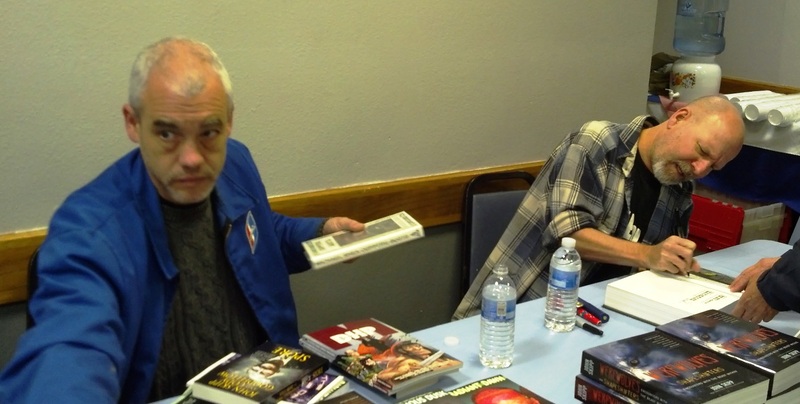 It was a feel-good story when a copy of Norman Spinrad’s long-lost Star Trek script “He Walked Among Us” surfaced at a convention last fall and the web series Star Trek New Voyages: Phase II picked it up for production. By all indications CBS is within its rights. In the entertainment industry the paid writer of a teleplay generally cedes the rights to the material, even if it remains unproduced. Note, this script is a completely different text from Sprinrad’s novel of the same name. Nominating votes for Canada’s Aurora Awards must be received no later than 12 midnight PST on March 31. Eligibility requirements and voting instructions are available at the Prix Aurora Awards website. Voting on the finalists will begin April 16 and close July 23. They’re off and running – for the Canadian Unity Fan Fund. Jane Garthson and Debra Yeung are competing to be named the CUFF delegate and represent fandom at When Words Collide (combined with the 2012 Canvention) in Calgary from August 10-12. Votes for CUFF race must be submitted by 12 midnight PST, April 17, 2012 to either the current Delegate, Kent Pollard, or the Eastern administrator, Diane Lacey. Eligible to vote are Canadian fans who have been active for at least two years as of April 17, or are paid, attending members of this year’s When Words Collide convention. Voters are asked to make a donation to CUFF — $5.00 is the suggested amount. Either use Paypal and e-mail — kentpollard@gmail.com — or paper mail (with checks payable) to Kent Pollard at 1222 Junor Ave., Saskatoon, SK S7L 7K1, Canada. Christopher Priest does not like the Arthur C. Clarke Award nominees. Despite teeing off in a style reminiscent of Spinrad, his arguments are as easily understood as Seuss: Priest thinks these picks are mostly wrong. He thinks the books are not too strong. He says throw this shortlist in the trash. He would not give these books the cash. The Arthur C. Clarke Award goes to the best sf novel first published in the UK during the previous year, as chosen by a panel of judges from the British Science Fiction Association, the Science Fiction Foundation and (this time around) the SCI-FI LONDON film festival. We have a dreadful shortlist put together by a set of judges who were not fit for purpose. They were incompetent. Their incompetence was made more problematical because the overall quality of the fiction in the year in question was poor. They did not know how to resolve this. They played what they saw as safe. They failed themselves, they failed the Clarke Award, and they failed anyone who takes a serious interest in speculative fiction. 1. The present panel of judges should be fired, or forced to resign, immediately. Their names are Juliet E. McKenna, Martin Lewis, Phil Nanson, Nikkianne Moody and Rob Grant. Chairman Andrew M. Butler should also resign. These people have proved themselves incompetent as judges, and should not be allowed to have any more say about or influence on the Arthur C. Clarke Award. 2. The 2012 Arthur C. Clarke Award should be suspended forthwith, and the planned awards ceremony on 2nd May should be cancelled. 3. The award fund (£2,012.00, as I understand it) should be held over until next year. Next year’s fund should be added to it, so that the prize for 2013 becomes £4,013.00. 4. The 2013 Clarke Award should be made to the best novel published in the two years ended 31st December 2012. All novels currently eligible for the 2012 award, whether or not they have been shortlisted by this year’s panel, are eligible again. 5. All the other usual rules of the Award should be applied. [I] believe that if Embassytown is China Mieville underachieving, we should all slack as well as he. But of course that’s my point, and in any event it’s a rare nomination slate for any literary award that does not have someone railing against it as a parade of mediocrities, or worse. First the New Wave, then wave after wave of SF writers have swept past Christopher Priest. Many of them far less intelligent. Most of them far less educated in the field of SF. And now, just when Priest might have expected to be acclaimed as an elder statesman of the genre, another wave of writers have taken the limelight instead. Maybe it’s being a fanzine fan has made me touchy about that kind of thing, but darned if Walter didn’t leave me almost feeling sorry for Priest, and having read a lot of Priest’s rants over the years (here let me borrow Ben Bradlee’s line) I didn’t think that was possible. Update 03/30/2012: Corrected the affiliation of one Clarke judge per Mark Plummer’s comment. The 2012 Hugo Award nominees will be announced simultaneously at five conventions in the United States and Europe on April 7. Arrangements are also being made to broadcast all five convention presentations via Ustream. This is the fourth consecutive year Worldcon members have cast a record-breaking number of Hugo nominating ballots. Chicon 7 received 1,101 nominating ballots, exceeding the 1,006 received by Renovation last year. Prior to that Aussiecon 4 received 864 in 2010 and Anticipation received 799 in 2009, each a record-setting figure at the time. Marcon 47, an annual Midwest sf con, at Columbus, OH (4 p.m. EDT). Olympus 2012, the British Eastercon, (9 p.m. BST). The final ballot voting deadline will be July 31, 2012, midnight PDT. The winners will be announced at the Hugo Awards Ceremony on Sunday, September 2. Alaya Dawn Johnson and E.C. Myers will present at the New York Review of Science Fiction Readings on April 3. Alaya Dawn Johnson‘s urban fantasy novels Moonshine and Wicked City are set on the Lower East Side of 1920s New York City. She has also written Racing the Dark and The Burning City, the first two books of a fantasy trilogy called The Spirit Binders. Her YA debut, The Summer Prince, will be published in spring 2013. Her short stories have appeared in the anthologies Welcome to Bordertown and Zombies vs. Unicorns. E. C. Myers’ debut Novel, Fair Coin, has just been released from Pyr. He is a graduate of the Clarion West Writers Workshop and a member of the writing group Altered Fluid. Bud Webster has won the 2012 Service to SFWA Award for outstanding work on behalf of the Science Fiction and Fantasy Writers of America. He is being honored for his efforts on The Estate Project, which collects information about deceased members of the professional sf community. This data is used by editors, publishers and agents to research rights, obtain permissions, make payments, and ensure legitimate publication without copyright violations. As part of this effort SFWA created an estates page on its website. The full press release appears here on the SFWA website. Anyhow, the eschatologists’ judgment is that the book is going to die and go to heaven or hell, leaving us to the mercy of Hollywood and our computer screens. There certainly is something sick about the book industry, but it seems closely related to the sickness affecting every industry that, under pressure from a corporate owner, dumps product standards and long-range planning in favor of ‘predictable’ sales and short-term profits…. The life span of a book is more like that of the horse, or the human being, sometimes the oak, even the redwood. Which is why it seems a good idea, rather than mourning their death, to rejoice that books now have two ways of staying alive, getting passed on, enduring, instead of only one. By John King Tarpinian: On Sunday March 25th I got to play the Author Wrangler for the 33rd Annual Vintage Paperback Collectors Show & Sale in Los Angeles. The show has two major draws, first, the ability to buy vintage dime novels, pulps, comics and magazines. Second, you have the chance to meet some of your favorite authors and get them to sign your books. I am told that there are only two other shows of this type, one in New York and another in the UK. 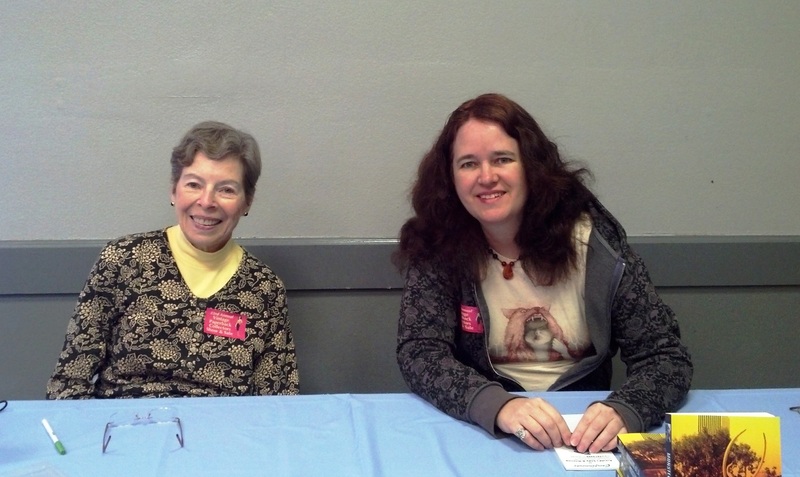 There were forty-seven dealers selling and forty-four authors greeting their fans and signing books. 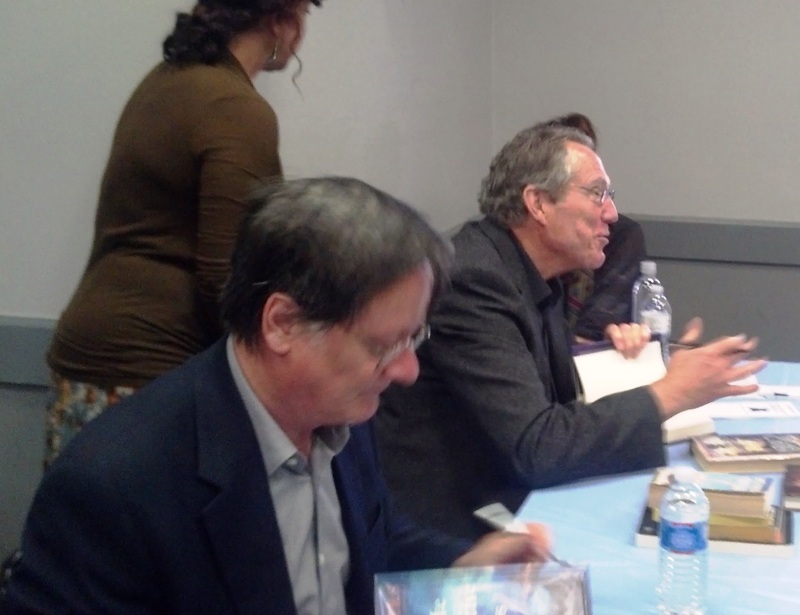 If you were unable to attend I am sure a goodly number of the books signed are already for sale on eBay. It is always fun to be able to talk to these authors but I will only highlight a few. We have a couple authors who seem to be connected at the hip. 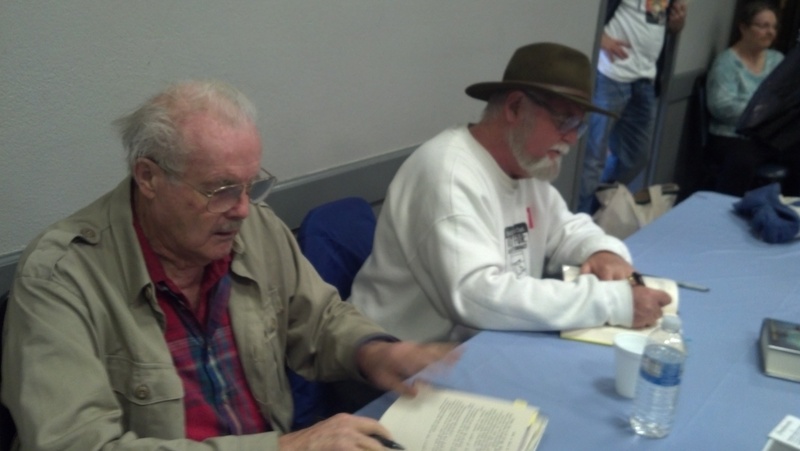 Larry Niven and Jerry Pournelle. William F. Nolan and George Clayton Johnson. A close third would be buddies Tim Powers and James Blaylock. Tim has a new book out just last week. Nobody came in Steampunk costume to visit with Blaylock. 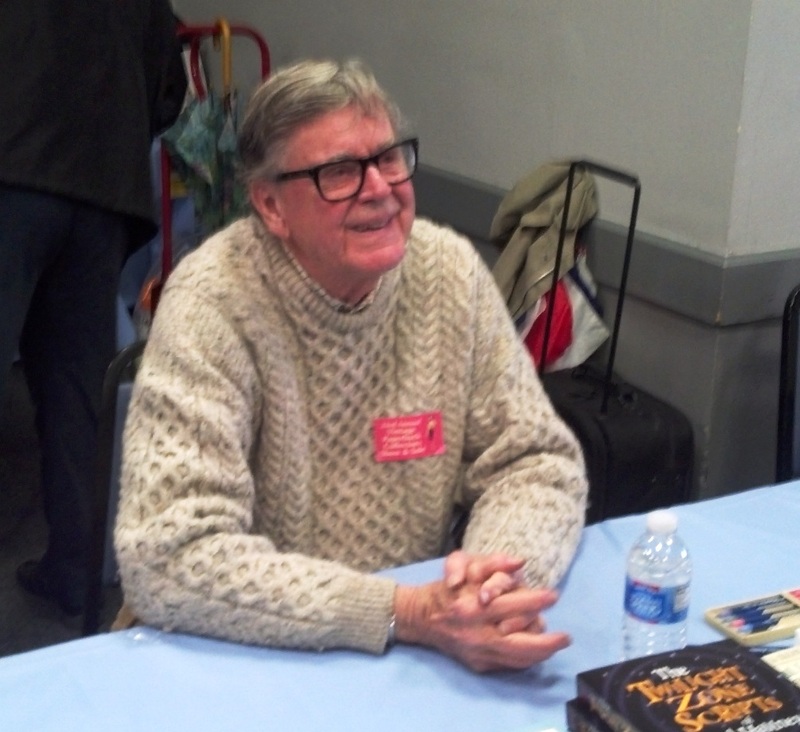 One of the nicest men you’ll ever meet in the print world or the TV world is Earl Hamner, Jr. (Think Twilight Zone, The Waltons and Falcon Crest) Another jovial man is Peter Atkins, you’d never know he wrote the script and books for the some of Hellraiser series for his buddy Clive Barker. Or Dennis Etchison who wrote the scripts for Halloween II and Halloween III. If you are in the need of an Encyclopedia on Halloween there is the sweet Lisa Morton. Lastly, I’ll highlight Harry Turtledove who is great to joke around with. We were afraid that most people in the other part of the world call drizzle but us Angelinos call a StormWatch would keep people away but it was the largest turnout recorded. You can find the complete list of authors who attended here: http://www.la-vintage-paperback-show.com/index.html. Ann Bannon and Lisa Morton. Cody Goodfellow and John Skipp. Tim Powers and James Blaylock. Michael Lee of CONvergence, where Paul Cornell will appear in July, sends his answers to my survey questions about the gender balance initiative. > Do you think Cornell’s initiative will change or has already changed your approach? > Do you have any comments on Paul Cornell’s and Si Spurrier’s actions? Michael Lee: It’s possible that since our convention’s theme is Women Characters and Creators this year, and we’ve had Paul as a guest, I might have something to add. I’m the head of activities at CONvergence, and that means the programming department reports up to me, and I also sit on the board of directors for our non-profit. I was also a programming head for five years before that. This is primarily my own thoughts here, and isn’t an official CONvergence statement. CONvergence had Paul Cornell as a guest of honor two years ago, and he’s returning on his own this year. He’s a popular and fantastic panelist and participant, and I respect what he’s trying to do here. Our convention theme this year is “Women Characters and Creators in Science Fiction in Fantasy” — and the organization chose to make all of our guests this year women, in part because we haven’t historically been as representative as we could have been with guests of honor, and we’re trying to do better. Our membership is very evenly matched with men and women, as well as having a mix of men and women on our staff all the way up to our board of directors. One thing I did was I started to track the overall distribution a little closer than before in response to Paul’s request in our programming database for CONvergence — not because I expected that each panels will balance 50/50, and we don’t have genders identified for all of our panel participants. We’re still in the process, so I don’t know where we’re going to end up, and I’m sure we’ll have things that work well and things that don’t. I believe that the threat of civil disobedience to make spontaneous programming replacements is something that most conventions can avoid with some co-operation with participants. I know that he’s made his request about being on gender-balanced programming items to CONvergence’s programming team, and that’s not really much different of a request than people who don’t want panels before noon, or don’t want to be on a panel with someone they don’t get along with, or that they want to be on a panel with their friends, or any number of other requests that people make to program teams. I know that we try to plan our programming schedule out far enough that we’re trying to work with Paul on specific items, just as we try to balance a lot of peoples’ desires to see what they want in programming. I think Paul’s efforts have helped emphasize the issue of women on convention panels, and I think that is a good discussion to have. I think we’ve seen that across the wide variety of responses you’ve already had on this subject, by a lot of people that I have a lot of respect for. I think it’s part of a larger movement that we’ve been seeing, not just in SF fandom, but also very strongly in comics fandom and Doctor Who fandom (which Paul is actively a part in as well), and other parts of the culture (like technology) where women making their presence known and acknowledging the institutional barriers to women (as well as other groups) in the culture. And really, I think it’s important for those of us that are conrunners toot just making programming participants more varied, but also making a stronger more diverse mix as guests of honor. And it’s also to seek out and be happy when you see a more varied mix of creators in books, comics, and television shows. We’re after all in a world where perhaps the most successful fantasy book series and the most successful science fiction book series are written by women. That needs to be reflected in our conventions as well.